The OrionLX+ brings more power, ports, points and memory to the most flexible and intuitive substation automation platform on the market. Introducing the latest edition in the industry-leading Orion family of substation automation platforms. The OrionLX+ provides the power and flexibility for larger, more challenging applications while making it even easier to use and maintain. Six times more processing power translates into the ability to handle more points (up to 40,000), store more points and operate with much lower CPU loadings in larger applications. Single or redundant supplies can be ordered, each removable under power from the front of the OrionLX+. For higher reliability, both power supplies share the load, and are health monitored by internal Orion diagnostics. 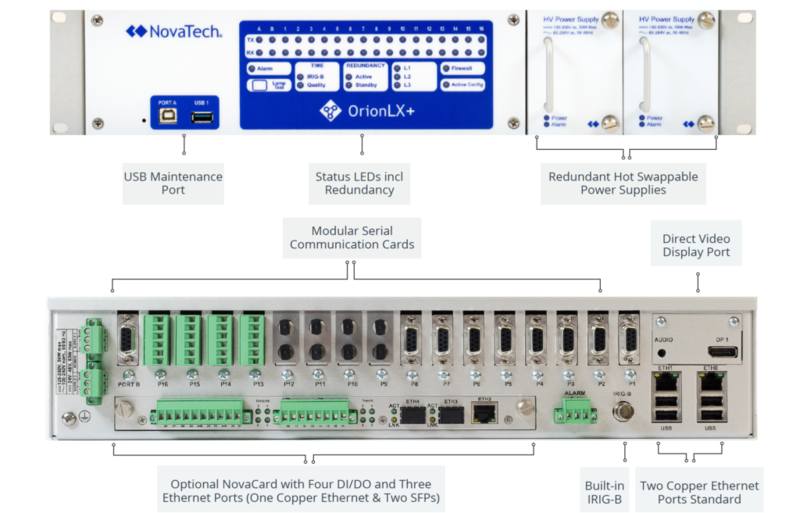 A new “NovaCard” Expansion Card adds three more Ethernet ports (separate NICs) to the standard two copper Ethernet ports on the OrionLX+, for a total of five Ethernet ports. Two of these are “SFP” (Small Form-Factor Pluggable) ports, for which we offer multimode, single mode and copper SFP transceiver options. Enhanced video support speeds up page load and supports both resistive and capacitive touch monitors for improved touch-screen performance. Status LEDs have been added to the front panel, and two of the five available Ethernet ports can be dedicated to redundant synchronization, leaving three physical Ethernet NICs available for other substation automation tasks. The OrionLX+ shares the same operating system, serial communication options, and configuration techniques of all other Orions, allowing for seamless migrations and easy setup. The same serial communication cards can be shared between the OrionLX CPX and OrionLX+. For over thirty-five years, NovaTech products and engineered solutions have helped hundreds of electric utilities and process manufacturers around the world to simplify complex technical challenges, reduce risk, and maximize return on assets. With the use of a NovaTech support account, this will enable automatic updates within NCD, ensuring access to the latest software features. After configuring your IEC-61131 logic you need to test the logic by using the “Go Online” tool.